Louisiana's Governor Declares State Of Emergency Over Disappearing Coastline : The Two-Way It's an effort to bring nationwide attention to the issue and speed up the federal permitting process for coastal projects. The state loses the equivalent of one football field of land an hour. A boy fishes on a bayou near Isle de Jean Charles, La., in August 2015. Louisiana is still losing about a football field of coastline every hour. Louisiana Gov. John Bel Edwards has declared a state of emergency over the state's rapidly eroding coastline. It's an effort to bring nationwide attention to the issue and speed up the federal permitting process for coastal restoration projects. "Decades of saltwater intrusion, subsidence and rising sea levels have made the Louisiana coast the nation's most rapidly deteriorating shoreline," WWNO's Travis Lux tells our Newscast unit. "It loses the equivalent of one football field of land every hour." More than half of the state's population lives on the coast, the declaration states. It adds that the pace of erosion is getting faster: "more than 1,800 square miles of land between 1932 and 2010, including 300 square miles of marshland between 2004 and 2008 alone." 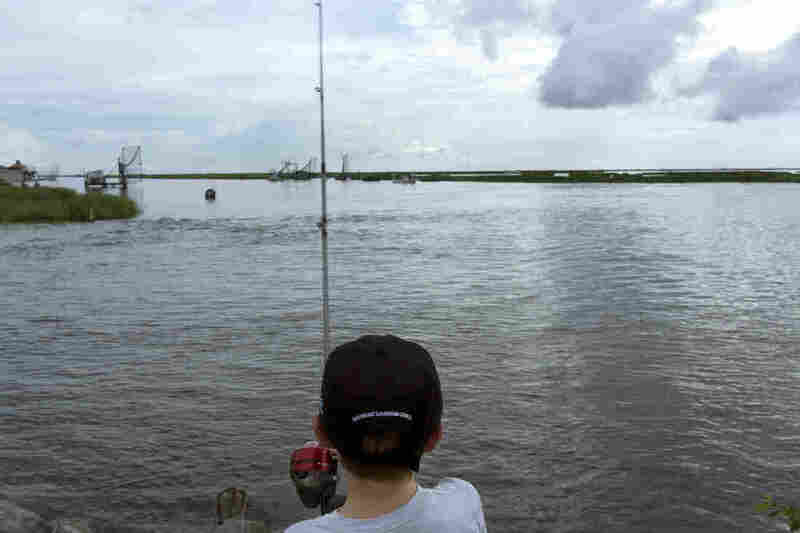 The governor estimates that if no further action is taken, "2,250 square miles of coastal Louisiana is expected to be lost" in the next 50 years. He emphasized the importance of the land to industries such as energy, maritime transportation and trade. "The state has a plan to implement more than 100 restoration and protection projects — like rebuilding marshes and barrier islands — but some of those projects are getting slowed down by federal environmental permits." Those projects are part of a 50-year, $50 billion master plan that was unanimously approved by a state panel on Wednesday, according to The Times-Picayune. The newspaper says the plan "relies largely on money from settlement of the 2010 BP oil spill litigation to speed restoration of coastal land and wetlands and protect them from hurricanes." Now Edwards is asking President Trump to declare the erosion of Louisiana's coast a national emergency and "provide appropriate federal attention and cooperation" to assist the state. The emergency declaration also asks for Congress to "consider legislation to provide for means by which to expedite all federal permitting and environmental review." "The juxtaposition of urgency and long-term planning is necessary when it comes to the coast, state officials have said. Projects to help stave off land loss will take years to design and build, but an emergency declaration could cut years off the permitting process for those projects."